My favorite thing about going into a cemetery is walking among the gravestones and deducing the stories of people buried there. If you’ve read WE’LL BE THE LAST ONES TO LET YOU DOWN, you know that I’ve been doing this my whole life. Some gravestones are simple: you have only a date of birth and a date of death to go on. But still, if you know something about history, you can make some educated assumptions. Maybe the person was born during the Civil War, and is buried next to his father, a Civil War veteran. Did the mother have to give birth alone, while her husband was away at war? Maybe the date of death was 1918, or 1933, or some other year of a known pandemic, such as the Spanish influenza or whooping cough. When I went to Boston in early March for the Association of Writers and Writing Programs conference, my first stop (after the hotel) was the famous Mt. Auburn Cemetery across the river in Cambridge. I wrote an earlier post about the visit in general. I plan a series of additional posts that highlight some of the cemetery stories that intrigued me. I’ll start with the Fuller family. I was reading this review of a new book about Margaret Fuller, who is buried at Mt. Auburn. The Fuller family has an entire plot. 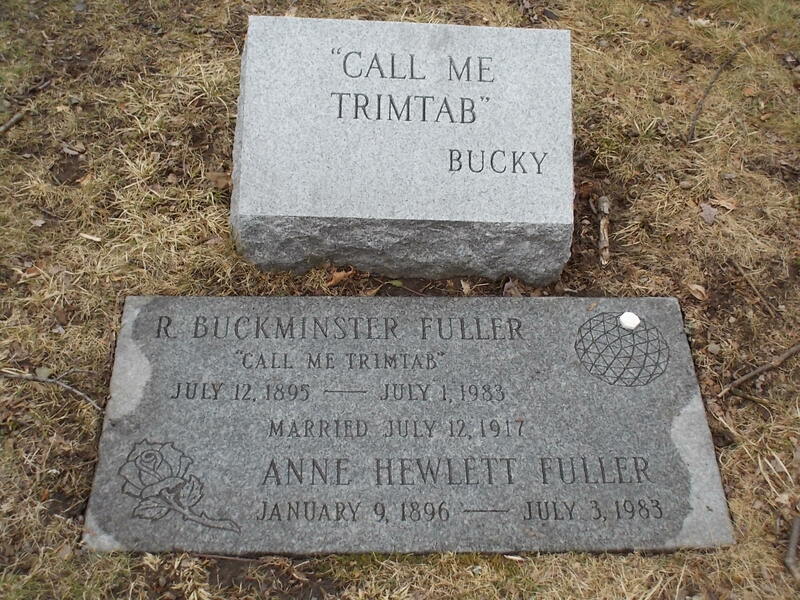 I recognized the name of R. Buckminster Fuller but did not have a firm grasp on who he was. Nice, simple gravestone, don’t you think? He invented the geodesic dome. However, his great-aunt’s gravestone (which is actually a cenotaph because she died at sea) tells an entire story. No deductive skills needed here! Photo by author. A detail of the cenotaph. Photo by author. The entire cenotaph. Photo by author. 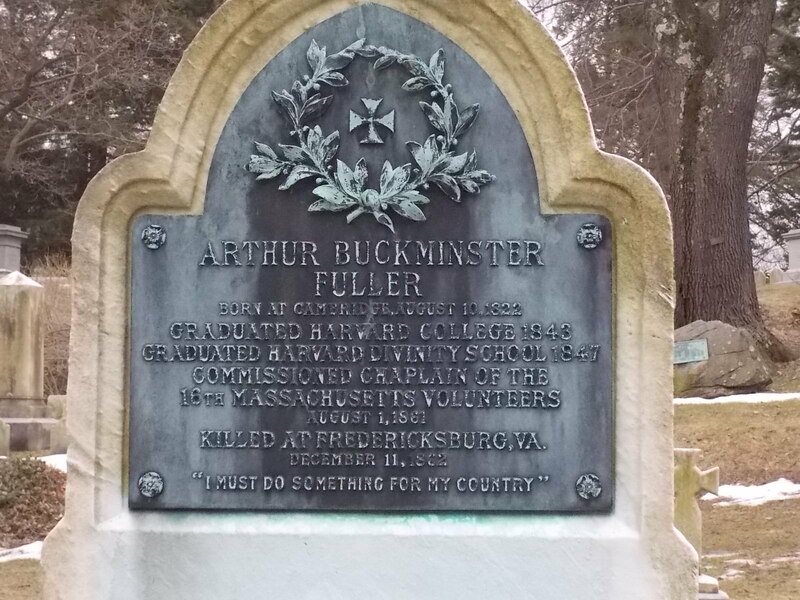 Detail of Arthur Buckminster Fuller’s gravestone at Mt. Auburn Cemetery. I spent only a couple of hours at Mt. Auburn that day. You could easily spend a day or two there. On that early March day, it was cold and rainy and dreary. But I loved it. I was almost all alone there. Far from the vision that founder Jacob Bigelow had for the cemetery, but I appreciated the solace. I’ll post more pictures and stories from Mt. Auburn. I’m also going to start a new series of guest posts about cemeteries, so watch for that announcement! 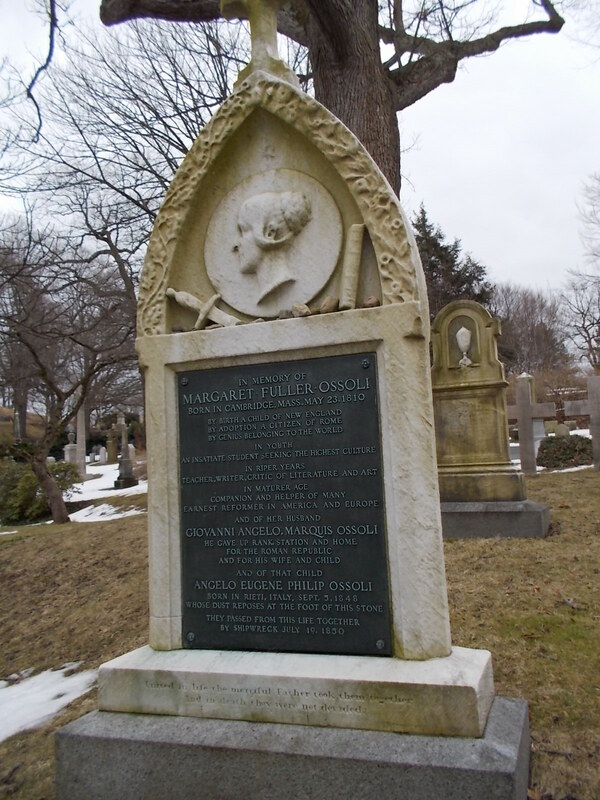 Wonderful stones of the Ossoli family. I got to the bottom line about the shipwreck and my heart literally fell. So sad.